I picked this one up from Tod during his holiday sale. 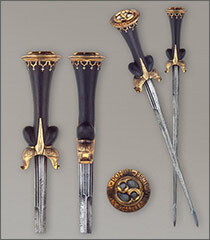 A 15th century Bollock dagger featuring a very stout, 11.5 inch hollow ground blade, with a reinforced point. Very stout, yet stylish. Just my thing. Very nice - I like all the details on that. That hilt is beautiful, right? I love my version, too. Congrats! 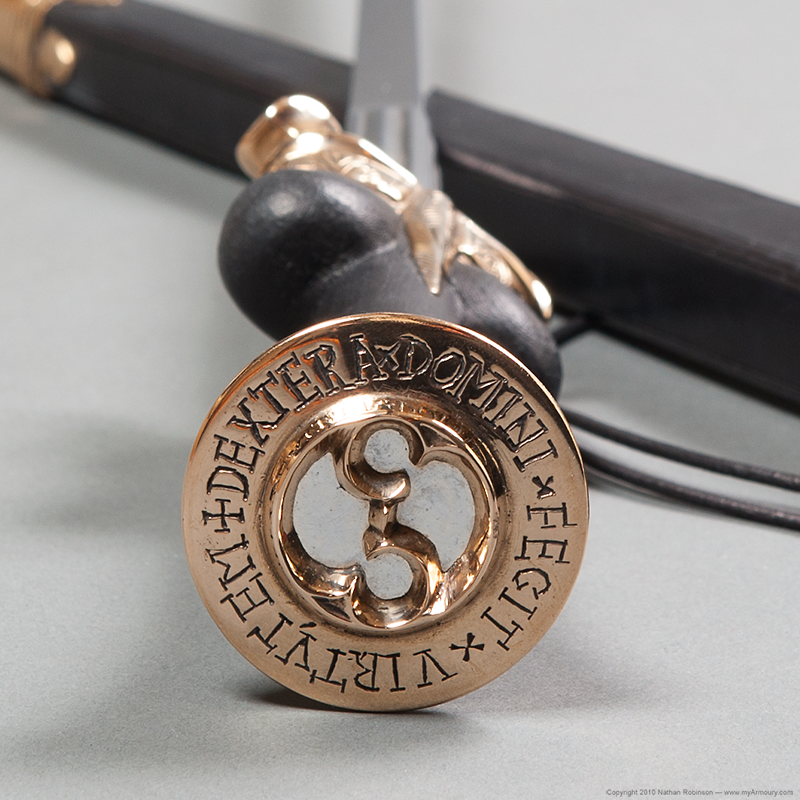 Big fan of the Rothenburg dagger too, whatever blade this hilts gets fitted to, can't fail to impress. On the original, did it have gems inset into the pommel? pommel on the original is pretty much exactly as you see it there. The only difference is I understand the panel is pierced and has a silver (Or more accurately,. "white metal", since I'm not sure it is silver) plate beneath where this one is bronze. no gems, just engraved text and sculptural form. You know what I love most? Look at that peak of the hollowgrind, up close to the guard. the dark lines from grinding it still visible, the smaller lines close to the edge where its not been polished out. There's dark streaks on the bronze casting, where the surface isnt perfectly smooth. look at the photo of the tip, and there's an asymmetry, a little flat bit that's off-centre where the transition to a reinforced tip is. and the pommel? similar casting faults. And each of those faults? Its those that make this perfect. Those are the marks a real one would have. Its something which shows this is a handmade weapon, and like the real ones I've been lucky enough to handle, it displays the faults which make it alive. Its an absolute pleasure to see such a piece of workmanship up close. No. There were no gems. Regarding the imperfections, I agree. Tods decision to leave the finishing in this state is a good one as it more accurately reflects the nature of the process, as well as an accurate portrayal of the antiques it mimics. I like it. Agreed! But less is good. Wow, thanks for the responses guys, I really appreciate it. Yes my stuff has flaws, but as James says and I agree, the originals did and so I generally make my pieces a bit tidier than the originals as often they were really quite rough, but perfection is not a bar I aim at personally as for me it feels wrong. That is by no way to denigrate other makers who unbelievably skilfully pursue perfection as some do on this forum. As was pointed out, the original does in fact have cut outs with a silver panel underneath, but no jewels or enamels etc. This is a feature I have done on one of these daggers. Weird as it may sound, I actually like it more, because of being able to know of those faults, than I did, having seen photos of just the whole thing. actually capturing the details - and the shortcuts of the real ones is something that is sadly forgotten too often. There's brilliant scots two-hander in the Glasgow reserves where you can still see the marks from off the file used on the hilt. That tangible connection back to the maker of the real one is something that fascinates me.